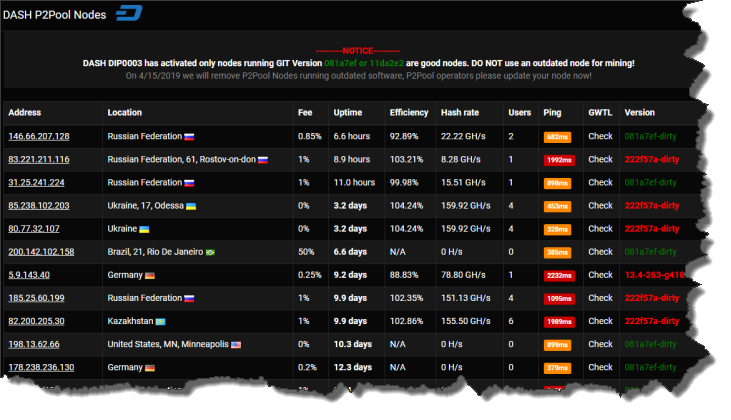 It's unfortunate, but we are still seeing many pools in the DASH P2Pool network that are running outdated software. These pools, and the miners that are using them, are doing the rest of the P2Pool Network a dis-service reflected in low payouts due to wasted hash rates. There are pools that are running outdated software which will be removed from the P2Pool Node List. If you look at the DASH P2Pool node listing ( http://www.p2poolmining.us/p2poolnodes/ ) you will see that we have flagged those pools running outdated software by displaying the Version in BOLD RED color. We have also sorted these pools, so at the moment, they are displaying lower in the listing than other pools running updated software. Effective April 15th, 2019 – Any P2Pool Node running a version of software other than a derivative of GitHub version 081a7ef or 11da2e2 will be removed from the P2Pool Listing. Once these pools update their software they will automatically be updated back into the P2Pool Node Listing. The latest release of the P2Pool software was updated on February 22nd, 2019. Hence we feel P2Pool operators have had plenty of time to update their pools. If you are a DASH Miner, mining on one of these outdated P2Pool Nodes. Then we encourage you to switch to a different P2Pool Node that is running updated software. These nodes are not contributing to the overall P2Pool Network and most likely are not paying out rewards at the levels they should be. Thanks for your continued Support of P2PoolMining!